Editor’s Note: The following is from Bill Haltom’s book, Some Assembly Required: A Daddy’s Christmas Book. One out of every two marriages in this country ends in a divorce. Why? Well, I can’t prove this, but I firmly believe that the alarming divorce rate in this country is directly related to putting up Christmas trees. I am proud to say my wife and I have a very strong marriage. For over 36 years, she has tolerated my snoring, my burping, and my tendency to spend the entire weekend on the sofa clutching a channel changer while I watch 47 consecutive college and pro football games. For 364 days a year, we have a strong, stable marriage. But one night a year, everything falls apart. That’s the night we put up the Christmas tree. Each year in early December, my wife and kids and I drive to the parking lot of a shopping mall where my wife purchases a Christmas tree that is approximately the same size as the one at Rockefeller Center in New York City. After I take out a second mortgage on my home to pay for the tree, a crew of tree salesmen somehow manage to lift the tree and strap it on top of our minivan. This is quite a feat considering the fact that the tree is generally twice the size of the van. My wife and kids and I then pile back in the minivan, and I drive back down the interstate at approximately five miles per hour in constant fear that this giant tree is going to roll off the top of the van and create the biggest traffic jam in the history of Interstate 40. Several hours later, when I finally get home, the fun really begins. 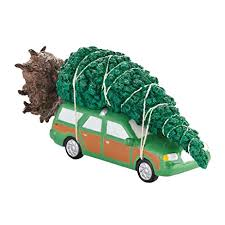 First, I have to remove the tree from the top of the minivan. Now remember, folks, it took a crew of 17 big men at the Christmas tree lot to hoist the tree on top of the van. But once I get home, it’s Daddy’s job to personally lift this giant Sequoia off the minivan and carry it (the tree, not the minivan) into the house. If I manage to get the tree into the house without giving myself a holiday hernia, I still face the toughest task of the day: balancing the Christmas tree. It is at this joyous moment of the holiday season that my wife and I both consider calling divorce lawyers. While my wife barks out orders like a Marine bootcamp drill sergeant, I desperately attempt to balance the giant Christmas tree, using the ancient Christmas tree stand I bought at a yard sale in 1994. My wife generally has the patience of Job. However, one night a year, she cannot comprehend why it is impossible for me to get a 10 foot high Christmas tree to defy the laws of gravity in our den. My wife and I snipe at each other for hours while I clutch the Christmas tree and experience Yuletide acupuncture, as thousands of pine needles pierce my aching body. After several crash landings, we somehow manage to balance the tree. Of course, by this time, my wife and I are in no mood whatsoever to trim the tree, since we’ve stopped speaking to each other. Talk about Silent Night! But despite broken ornaments, bleeding hands, and my aching back, somehow our marriage always survives the balancing of the Christmas tree. Maybe it’s because when I finally get the tree balanced, I don’t call a divorce lawyer. I call a chiropractor.